← antifa notes (december 20, 2016) : Phillip Galea & Co.
Last year, the Arena magazine blog published a post titled ‘Reflecting on Solidarity after the Coburg Protest’, by Andy Blunden and Lynn Beaton. By examining the origins and meaning of the term ‘solidarity’, and then applying it to the events in Coburg on May 28, the authors are able to conclude that a minority which violates solidarity with the majority is called a scab; further, at least by implication, that the minority guilty of violating this principle were those groups of anti-racists who were determined to directly confront the racist groups on the day. Implying that the anti-fascists who confronted members of the True Blue Crew (TBC) and United Patriots Front (UPF) in Coburg on May 28 are ‘scabs’ is an interesting position to take, so I thought I’d examine the authors’ argument a little more closely, and offer a few more reflections on ‘solidarity’. On Saturday 28th May a peaceful rally, ‘Moreland Says No to Racism’, was successfully held outside the Coburg library. The rally was organised many weeks beforehand; sixty local organisations (including the Moreland Council) endorsed the rally, and publicity was widely distributed. Racist groups from outside Moreland made their intention to disrupt the rally known. In response groups of anti-racists determined to directly confront the racist groups. The resulting brawl captured media coverage of the day almost completely. There was minimal communication between the two groups, and no agreement as to plans for managing the events of the day. • The ‘Moreland Says No to Racism’ rally was announced some months prior to its occurrence and was endorsed by a variety of groups, including (somewhat controversially) Moreland Council. It was organised by Sue Bolton, a Moreland councillor and member of the Socialist Alliance, and organising began in February. Another councillor, Samantha Ratnam, who was scheduled to speak at the event, withdrew a few days prior, citing concerns over the possibility of violent clashes. • The ‘True Blue Crew’ (TBC) announced their intention to disrupt the rally in late April. They were soon joined by the ‘United Patriots Front’, ‘Patriots Defence League of Australia’ (PDLA) and others. Their counter-rally was titled ‘Stop The Far Left’. Unfortunately, local fascists have decided to organise a counter-rally: in order to express support for mandatory detention and offshore processing, to denounce local Muslims as terrorists, and to attack the ‘far left’. This counter-rally is scheduled to take place at 10.30am at Bridges Reserve, the endpoint of the proposed march. 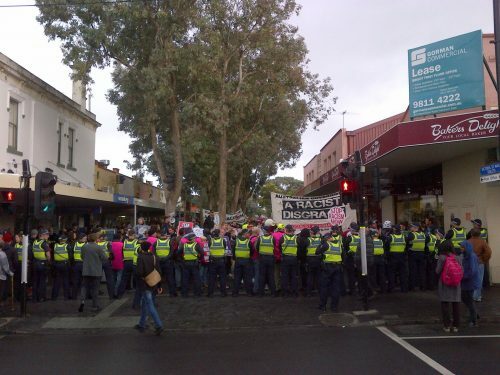 It’s been organised by the ‘True Blue Crew’ (TBC), a small group of right-wing racists from Melton and Bendigo. They’ve been joined by their neo-Nazi friends in the ‘United Patriots Front’ (UPF) and a range of other far right elements can also be expected to attend. The suburb of Coburg and Moreland generally is home to a diverse range of communities: ethnic, cultural, linguistic, national and religious. Many of these communities are ones that the UPF and Co. would like to see eliminated. The presence of an organised group of neo-Nazis, fascists and racists poses an immediate danger not only to locals but, if left unopposed, will further embolden these groups and individuals to continue to prosecute their divisive, racialised and reactionary politics. Coburg has a proud history of resisting fascist intrusions into public spaces. It’s important to carry on that tradition and to let local fascists know that they are not welcome. Please attend the rally on Saturday, let others know about the rally, and be advised that a small group of fascists will be in the area, looking for opportunities to attack it and other targets. Our solidarity is our weapon. In which context, a few additional points. First, I’d considered promoting attendance by anti-fascists earlier than this but was eventually convinced by anti-fascist comrades that it would be better to simply encourage others to attend the ‘Moreland Says No to Racism’ rally (ie, there was no need to create another Event page). A week out from the rally, however, I learned that rally organisers had cancelled their plans to march to Bridges Reserve and would do their best to avoid any possibility of confronting the TBC & Co. by marching in the opposite direction. I understood this to mean that a group of fascists would be free to assemble and to march in Coburg. For the reasons outlined in the blurb, I thought this was a Bad thing. Secondly, my intention in promoting the possibility of driving ‘Fascists Out of Coburg!’ was, first, to try and ensure that a large number of people would attend the rally. The more people who attended, I believed, the less likely the rally would be disrupted or its participants attacked and, further, the more likely it would be possible to confine the fascists to Bridges Reserve and to prevent them from marching anywhere (or doing much of anything). On the day, when it became obvious that the rally was secure (ie, it was not going to be disrupted or attacked by fascists), I along with others elected to leave Coburg Mall — the site of the ‘Moreland Says No to Racism’ rally — to go to Bridges Reserve to attempt to stop the fascists from marching. Initially, a small group managed to do so before police blocked the Mall. Thirdly, since the emergence of Reclaim Australia in early 2015, two major campaigning platforms have emerged in Melbourne: No Room For Racism (NRFR) and Campaign Against Racism & Fascism (CARF). Both promoted the rally and framed it in terms of ‘community self-defence’ from an unwanted fascist intrusion. The exact nature of their planning for the day is obviously best communicated by the group’s themselves, but I’m not sure it’s correct to claim that there was minimal communication between the two groups, and no agreement as to plans for managing the events of the day. Apart from anything else, the Socialist Alliance is a formal participant in CARF, and would therefore seem able to contribute to discussions and planning. On the other hand, it’s important to remember that, whatever plans were made in preparation for May 28, it was far from certain what would actually happen. For example, in light of a police and media campaign imploring others not to attend the rally, it was uncertain how many people would attend either event, whether or not the fascists would actually assemble at Bridges Reserve and, if so, if they would attempt to march — and would police facilitate this? That a decision not to march to Bridges Reserve was made by rally organisers only became apparent on the day, just as the fact that fascists did indeed assemble at the Reserve, were not present at the Mall, and did indeed intend to march. Fourthly, it’s important to situate both the attempt to ‘Say No to Racism’ and to ‘Stop the Far Left’ in their context. Thus, the TBC emerged in late 2015/early 2016 in the wake of Reclaim Australia and UPF rallies in Bendigo and Melton. The targeting of Sue Bolton in May 2016 echoed the UPF’s first public demonstration in May 2015, which targeted another socialist councillor, Stephen Jolly. This underscores the fact that — as they’ve reiterated over and over and over again — it is ‘The Left’ which self-described ‘patriots’ and ‘nationalists’ understand to be the chief impediment to their desire to rid Australia of Muslims. Finally, media coverage did focus upon the clashes which took place between TBC rally-goers and anti-fascists, and this obscured the fact that an ‘anti-racist’ rally was able to be held in Coburg. (See : The anti-racist rally in Coburg the media ignored, Sue Bolton, Green Left Weekly, June 3, 2016.) If the capacity to generate ‘positive’ news stories was compromised by these clashes, and if production of same was the chief aim of the (anti-racist) rally, then on this count it could be considered to be a failure. If, on the other hand, the aim of those participating in the (anti-racist) rally was to both manifest peacefully and to effectively prevent fascists from marching through Coburg, then the day may be considered as being successful. In either case, while an examination of the political economy of the mass media would suggest that, as Edward S. Herman and Noam Chomsky have written, it does not function in order to produce favourable accounts of political dissent, producing a systematic analysis of media reportage of protest and social struggle in particular is not my aim here. Rather, I’ll attempt to address the question of solidarity, how it’s applied by the authors in the case of May 28 in Coburg, and why I think this approach is problematic. We have written the post below to highlight the importance of solidarity between activist groups who identify as being on the left, and as fighting right-wing agendas and, in particular, racism. After elaborating upon the principles of communism (‘self-emancipation of the working class and solidarity’), the authors distinguish between class-conscious working-class activity and what amounts to charity; the philanthropic ‘rescue’ of the working class by elements outside of it. In the context of the Coburg events, the Socialist Alliance (SAll) is cast in the role of the (class-conscious) working class and the ‘groups of anti-racists who were determined to directly confront the racist groups’ are rendered as outside agents, coming to the aid of SAll but, crucially, unwilling to subordinate themselves to its direction. This failure means that the groups which confronted the fascists in Coburg and prevented them from marching may rightly be considered ‘scabs’. Or at least — minus the verbiage about communism, first principles, The First International, cavalry and strikes — that’s the basic lesson meant to be drawn from reading the article. As I see it, there’s a few problems with this argument. To begin with, there was more than one ‘stakeholder’ in Coburg on May 28. To put it another way, the presence of a small group of fascists in the suburb posed problems not only for those who gathered together under the umbrella of ‘Moreland Says No To Racism’, but to all locals — especially those who fail to qualify, for whatever reason, to be able to join the ranks of the Übermensch of the TBC, UPF & Co..
Secondly, the authors make reference to different sections of the (working) class exercising autonomy; an autonomy which ceases once they ‘voluntarily submit themselves to a shared discipline’. While it’s not entirely clear how the various ‘sections’ are meant to negotiate this process, it seems fairly certain that, however the term is applied, it was not the case that all those involved in the day’s events undertook this voluntary submission to the authority of the SAll or the (other) organisers of the rally (let alone those who participated in the TBC/UPF rally). Of course, it could be argued that, if the intention of those attending was to express solidarity with SAll, then they were obliged ipso facto to do so in ways that met with the group’s approval and according to whatever criteria they set. In this case, that meant joining the SAll rally, marching to which ever point they were instructed to, and otherwise acting in accordance with the wishes of the rally organisers and its marshals. In other words, as the authors write, they should have obeyed a simple rule: ‘when coming to the aid of another party, do so under their direction’. But what if, as suggested above, the constituency ‘under attack’ is not singular but plural? That is, what if the threat posed by the fascist contingent was not just to the SAll but to Coburg locals, and to particular groups drawn from this community? In other words, what if, in reference to ‘the concrete conditions in which a group is struggling’, the ‘rescuer’ is not ignorant of the terrain, but inhabits it? To demonstrate how fundamental solidarity is to the workers’ movement, it should be observed that, alongside equality, solidarity is the guiding principle of majority voting which is the fundamental decision-making process of the workers’ movement. In any working class organisation actions are decided upon by majority vote (the principle of equality) and thereafter every member of the organisation is obliged to offer solidarity to the majority by adhering to the majority decision whether they like it or not. A minority which violates solidarity with the majority is called a scab. Leaving aside the various forms of decision-making which have been employed by working class organisations, the relationships between such organisations, and their relationship to the workers’ movement (or movements), it’s obviously not the case that those who participated in the events of May 28 belong(ed) to one working class organisation, or took part in a meeting at which a decision was made, via a majority vote, regarding what tactics were to be employed on the day by its membership. Further, the use of the term ‘scab’ in this context seems needlessly inflammatory: given the complaints regarding the actions of those who more directly confronted the fascist rally in Coburg, the pejorative would appear to be directed at these elements, but in reality it was only via their action that a fascist march was prevented from taking place. See also : Anti-racism: combine the tactics, Riki Lane, Workers’ Liberty, June 8, 2016. This entry was posted in Anti-fascism, Broken Windows, History, State / Politics, That's Capitalism!, Trot Guide and tagged Andy Blunden, Arena magazine, Campaign Against Racism and Fascism, Coburg, Lyn Beaton, No Room For Racism, Reflecting on Solidarity after the Coburg Protest, Solidarity, True Blue Crew, United Patriots Front. Bookmark the permalink. I agree with you 100% SB. I wrote a comment to the authors defending our community self defense and I asked the question who were the supposed scabs. They replied back in a cryptic fashion posing the question if an elitist minority hijack an organized working class rally (paraphrasing) who would be the scabs? In other words they thought we were scabs. Our counter rally stopped Nazis from trashing and hate crashing SAll’s rally. I am a trade union member, my comrades are trade union members, so to call us all scabs for doing what the cops should be doing (tongue firmly planted in cheek) ie protecting a rally and a community from Nazis, is a gross insult. What is even more offensive is that they are calling the local Muslims and first nations people who joined the blockade scabs. Some of the local Muslims were so welcoming of the blockade that they have attended and spoken at other anti Nazi actions. It is a sorry sign of the times that certain members of the anti capitalist left condemn anti Nazi pickets and community self defense. These same people were prepared to fight National Action in 1990s. All for naught really, this analysis, since the four rallies (Mall crowd, Muslim youths, patriots and anti racists) were controlled from start to finish by Vicpol. The patriots were prevented from marching by lines of police, not by anti-fascists. I’d also take issue with the characterisation of participants in the Moreland Says No To Racism and anti racist rallies as being representative of the working class of the district, local workers made their views abundantly clear at the time that neither side were welcome. I am blue collar working class and a local. I am a member of a union and of an ethno-religious background (despite being an athiest) that has long been a target of Nazis. My neighbor, who also attended the rally, is obviously also a local, and guess what blue collar working class (same type of industry but different work place) and that neighbor also attended. As local workers we don’t want fascists on our streets. The only hipsters I saw were either the ones tut-tutting in the cafés or those of the nipster variety on the fascist side of the line. would arena magazine publish a counter argument? what about inviting the authors to a mediation session where both parties could discuss this issue? surely such an invitation would put the authors on the back foot in a gentle way. most socialists, as well as green voters and lowercase liberals, know very little about anarchism – you only need to look in the trades hall bookshop. maybe. dunno. i mean, it’s a little dated (re coburg), but it may be of more general relevance re tactical qs re far right. but that’s not really what arena is about, being weighted more towards elaborations of marxist/critical theory, and having an older, more academic and (grad) student audience. that applies esp to its journal, though less so in the case of its zine. i think it would also require some further articulation on the part of the authors (one of whom, lynn beaton, sadly died recently (june 2016)). by which i mean, i may have misread the post/some things about it simply aren’t all that clear to me. beyond that, it also concerns (some) matters that may not be best suited to a public discussion. it would also require a more straightfwd presentation of exactly what’s at issue/what’s at stake, s/thing which would presumably require a more narrow (ie, coherent) focus. yeah, maybe … but i’m unsure, for var reasons, if it would be worth it. and i also think a number of the relevant issues simply reflect a diff in approach, which are unlikely to be resolved thru ‘mediation’. otherwise, i’m normally happy to yarn to folks about this kinda stuff — collective wisdom & action is a good thing. i think my response is fairly measured, and reasonable, but it wasn’t written in order to put anyone on the back foot (so to speak). mostly, i wrote it ’cause a lotta other ppl, many active in var anti-fascist campaigns, objected to it — esp re the insinuation of ‘scabbing’. possibly, yeah. i mean, i haven’t dropped by the NI for a while now, i do recall it carrying a no of anarchist titles, but it has a more general ‘left’ focus, and it’s not surprising it carries the kinda material its does, given also its history. re the understanding socialists, greens voters and liberals have of anarchism … i rlly dunno. i do think many of the more common critiques are facile, but then that’s almost always been the case, and i’m obv partisan. otoh, i know a no of ppl who’ve been involved in var marxist grps, the greens party, enviro mvmts etc, who’ve expressed, on the basis of their own exp of the political process, engagement w social mvmts, etc., a greater interest in anarchism (if not necessarily a great deal of knowledge). as a general rule, i think a real increase in interest in anarchism would follow a real increase in anarchist activity, ie, it’s up to the few hundred — or even few thousand?! — anarchists in MEL, eg, to demonstrate its relevance. it annoys me when anarchists and the like are wrongly accused of causing problems – the post about mick vs arterial bloc. anywho, MDC are scheduled to play here in T Land – feel very excited. I was at the Moreland Says No To Racism rally. Calling the antifa types who went to confront the Nazis “scabs” would be silly and an abuse of the term. Any “trouble” was largely a result of the sensationalised media coverage, which we don’t control. Ratnam’s role in the media coverage was the worst undermining of the event that I saw. On the other hand I can’t see what the antifa confrontation achieved. It certainly didn’t stop the nazi rally; the police controlled all the groups quite comfortably. The TBC, UPF etc are now fairly clearly identified as extremists/nazis and not building anything like a broad movement (which they perhaps could have if the original rally with Rise Up etc at Fed Square wasn’t defeated). Now they thrive on conflict. When the left wimped out of a counter-protest for the fascists’ second Melton rally/shemozzle, it deteriorated into fisticuffs between TBC and SOO. So why give them an antifa presence to unite against and rev up their adrenaline-addled bonehead ranks? It probably helps them recruit. Maybe I’m wrong but it’s worth considering. The Moreland rally as originally conceived was never about the nazis in particular, it was about racism more broadly, especially the federal government’s. To redirect it into confronting what is essentially the fringe of the far-right would have narrowed its message. Better to play to mainstream issues and try and make headway there, if possible (and perhaps the format wasn’t the best way to achieve that, but that’s another question). I guess some people think tiny inarticulate neo-nazi groups are a bigger threat than our far-right government, but that seems silly to me. Exactly how to confront the fascists on the streets is a difficult question, the first confrontation at Fed Square seems to have worked brilliantly for us, but taking a one-size-fits-all approach of physical confrontation at every turn is not giving the question the tactical consideration it deserves. 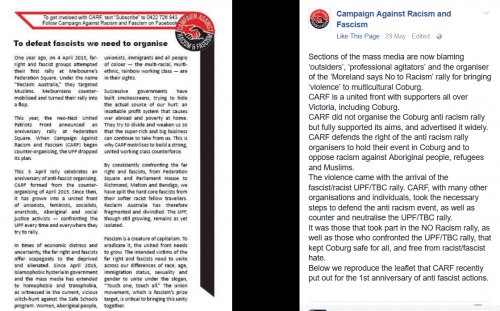 • The fascist rally in Coburg on May 28, 2016 was preceded by a number of other such rallies, including the Reclaim Australia rallies of April 4 and July 18 in the Melbourne CBD and in Melton on November 22, 2015; the UPF rallies in Richmond on May 31, in Bendigo on August 29 and October 10, and in the Melbourne CBD on November 28, 2015; the UPF and TBC rallied in Bendigo again on February 27, 2016. On each of these occasions there were counter-protests, and on many occasions there were clashes of varying intensity. • In terms of participation, while there were hundreds present at the Reclaim rally of April 4, the patriotik movement probably peaked six months later, in Bendigo on October 10, with some reportage claiming as many as 1,000 attended. • The least-heavily policed event was the first, on April 4, 2015. From that point on police established a strategy — basically, keeping the two mobs separate — which from their perspective functioned reasonably successfully. • The fact that a small number of people who attended the anti-racist rally ventured beyond the Mall to Bridges Reserve, where they assembled across Bell Street, is significant in the sense that the fascists too moved onto Bell Street, at which point there was a clash and police were forced to segment the crowd, placing themselves between the two groups. In the absence of this small group of anti-fascists — later joined by others who attended the Mall, as well as (previously unaligned) locals — it would’ve remained possible for the fascists to have marched up Bell Street. In other words, it could be argued that the presence of anti-fascists forced police to kettle the fascists at Bridges Reserve (notwithstanding the fact that other clashes between the two sides occurred in the Pentridge precinct) and that pressure from anti-fascists had a material impact on the day, both in terms of the policing of the event and the activities of the patriotik milieu. • As I see it, the UPF is basically a small, neo-Nazi cadre which is seeking to establish itself on a more permanent basis by way of activating its periphery, a periphery which is relatively large (if also largely inert), and drawn from a broader patriotik milieu which is completely unconcerned by the UPF’s status as neo-Nazi (a fact that is, naturally, denied by both core and periphery). 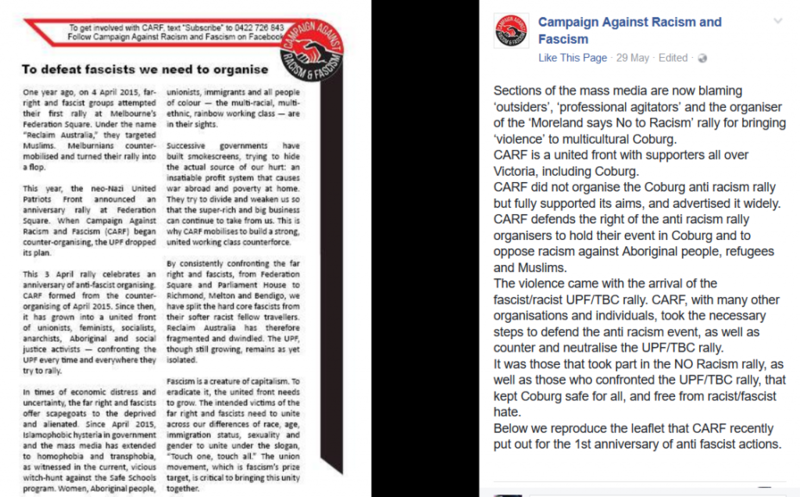 While the UPF has phantasies of being a truly national body, it remains centred on Blair Cottrell and Melbourne. The TBC is a sightly different kettle of fish, being built upon pre-existing social networks (typically familial), concentrated in Melton and Bendigo, and armed with even less political insight than the UPF. While there are differences, in this sense, it follows on the heels of the ‘Full Blooded Skips’, ‘Southern Cross Soldiers’, and allied nationalist, political ephemera. • The case of Bendigo is somewhat exceptional in the sense that the UPF were able to capitalise upon a pre-existing community campaign, and while the Bendigo business and political establishment were hostile to its presence, it was hardly committed to actively opposing the UPF by counter-protesting (‘I Believe in Bendigo’ actively discouraged participation). So: there are regional variations which have to be taken into account. • Inre the TBC rally in Melton at which there was some minor argy-bargy between the methgoblins and the Soldiers, yes, this may point to the utility of not always counter-protesting and/or seeking some form of confrontation with fascist forces. On the other hand, it could also be read as indicative of the general character of those attracted to such formations: the TBC has been disintegrating partly on account of the alcohol and drug dependencies of some of its members and also the proclivity of some of its key members to engaging in ‘intimate partner violence’. As I see it, what gives government action and non-state actors significance varies according to the context. Certainly, racism in office — ie, state racism — is generally far more powerful than racism ‘on the streets’. By the same token, creating a fundamental shift in government policy on, say, mandatory detention, or treaty negotiations, is no small thing. In that sense, it could be argued that effectively countering an incipient fascist or proto-fascist movement when it manifests publicly is a relatively simpler undertaking. Further, if political developments in Europe and North America are any guide, it may be unwise to simply dismiss the capacity of ‘tiny inarticulate neo-nazi groups’ to grow and achieve influence, and taking action to mitigate their growth in Australia is obviously more easily accomplished when they remain tiny … I’d also add that the appeal of such groups is almost never on account of their real or alleged status as neo-Nazi. Rather, broadly speaking, the far right — of which neo-Nazism is one element — is an opportunistic and pragmatic beast and in that sense a rational political actor which attaches itself to whatever it believes actually provides it with political opportunities. Hence the centrality of anti-Muslim as opposed to anti-Jew sentiment. In any case, I don’t think that the two activities — mobilising in opposition to fascist street mobilisations and campaigning to change government policy inre mandatory detention etc. — are counter-posed; they may even be complementary.